Along with my son’s birthday at the beginning of summer, came new video games for his XBOX 360. The video game world is new to us-our oldest was nearly 8 before we allowed him any kind of gaming and that was just this year. We often set times to limit their video games and Sundays have been our screen-free days. Still, it didn’t take long for us to experience first-hand the effects of gaming-changes in attitude (not the good kind! ), begging and pleading when we have already set a limit to how long they could play, arguing over taking turns, and general fit throwing when it came time to put the controllers down. What I quickly began to realize is that in my sons’ immaturity, gaming was becoming an idol. They cared more about video games than anything else. I was beginning to wonder where my sweet boys went! It seemed like gaming was winning out over our values as a family. As their mom, I knew that I needed to set some tight boundaries-not because I needed to control my kids with an iron fist, but because they simply were not capable of seeing the harm their behavior was causing the relationships in our family-between themselves as siblings, and towards mom and dad. We have a little mantra at our house: Relationships over things. If something we are involved in or obsessing over is harming a relationship, then we have to deal with it right away. When people become secondary to property, it's time to do damage control! So, this past week we held the very rare family meeting and laid out some new ground rules and more importantly, why we were doing so. I’m going to share with you what we decided to do in case you are feeling that tug on your heart that you need to take a similar plunge. The night before, we let them know that we were going to have a family meeting the next day-we weren’t doom and gloom about it, just wanted them to know that was going to be an important time for us to talk about some "family stuff". They nodded their heads-fine by them. First, we approached the conversation with an upbeat and positive attitude, not a serious scolding tone lest we lose and alienate our audience from the get-go. Then we reviewed Ephesians 6:1-3 to lovingly remind them that their role as kids is to obey mom and dad because God, in His love and wisdom knows that obeying us will result in a long and enjoyable life. I had each boy take turns reading a verse or answering some simple questions-short and sweet but keeping them engaged! More head nodding. So far, so good. Obey mom and dad because of our love for God? Check. And because it will lead to an enjoyable life? Check. I then briefly explained that we were going to be doing something new for the month of August (mind you, this will most likely stay in place but this month is our experimental time). We reminded ourselves that people are important than things and that we need to be outside more and using our brains because that is healthy for our bodies and it honors God when we take care of ourselves. Then, we took the plunge. Keeping my tone of voice upbeat, I explained that they would each earn 30 minutes after 3:00 PM every week day to play an educational game or watch an educational YouTube video about a game (They could also play one of their FAVORITE games, Just Dance , because it is physical and gets them exercising-fine by me!). They can lose the privilege to play but I would give them fair warning if that was about to happen. In general, I don’t parent with the reward system because I don’t want kids to do the right thing to get something. I want them to do the right thing, because it’s the right thing. But I also don’t want to remove games all together at this point, and in this area, it seemed a reasonable approach. Sundays would remain screen-free as in the past. As the parent you have to prepare yourself for a few days of complaining, kids being “bored,” and general withdrawal-like symptoms. This part? Not fun, I won’t lie. But, it’s worth it-I promise! As the parent, it’s important not to take their frustrations personally or resort to your own irrational behavior. Take it all in stride and loving and gently stick to your decision. My kids and I both had to adjust and it was important for me to set them up for success. Swap out old toys from the garage and bring them inside or set up outdoor activities so they have some “new” things to play with. Plan a few play dates with friends, particularly outside at parks or at local pools etc. Stop what you are doing more often to sit down with them to play board games or do crafts and artwork. 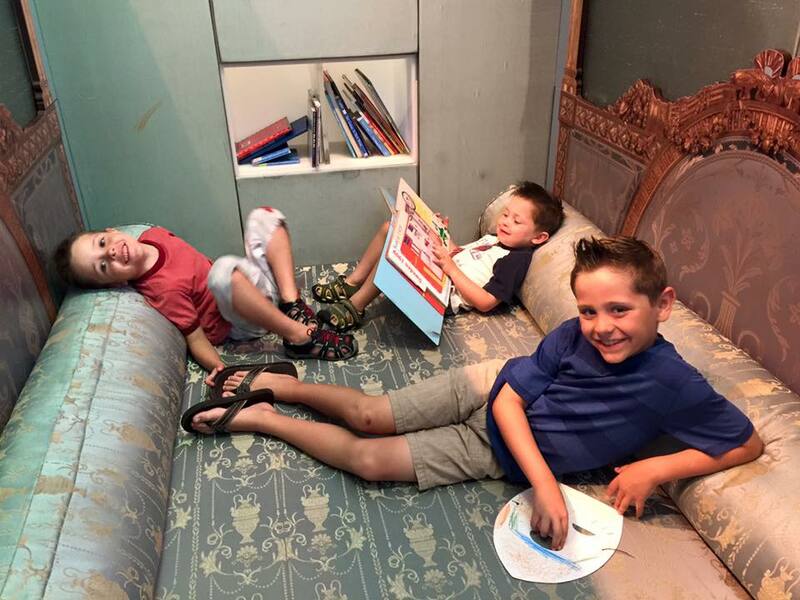 Implement a reading time where older kids read to younger ones. Offer constructive options to them before they begin to complain about being bored. Lovingly remind them when they are doing the right things, that you are proud of them and excited that they are earning their time to play a game later that day. How Are We Doing After Week 1? It hasn’t been a perfect transition but honestly, it has been much smoother than I anticipated. My husband forgot about our new guidelines one late morning and sure enough, I came into the room to kids playing video games. We regrouped and got back on track. No harm, no foul! Don’t let little hiccups or poor communication sabotage your new boundaries! And guess what? My kids are cooperating with one another again. They are playing games with each other, being creative with imagination play, and getting outside on the swing set! I call that success! We really are happier, after just a week of this new standard in our home. I’m wishing we had done this sooner! If you feel a sink in your gut when you think about your own family’s gaming habits, why don’t you join us in setting limits? Don’t let your fear of your kids’ reactions keep you from parenting them well! YOUR TURN! So tell me, do you feel like gaming is taking over your kids? Do any of these parameters seem like something you can try in your own home? What have you already done to set boundaries in your home and what is working for you? Also, this post contains a couple affiliate links, so when you make any purchase through those links, my ministry gets a few cents at no added cost to you-thank you!! UPDATE Week 2: Sweet relief-the boys aren't asking me to play all.day.long. anymore. They already know that they will get 30 minutes at the end of the day. And, they don't protest when the time is up! They are SATISFIED, people! Hallelujah! That's what being reasonable, positive, and CONSISTENT does for you. This Saturday, my son wandered in to the living room all sleepy-eyed asking what we were going to do for the day. I reminded him that he gets a full hour to play his choice of entertaining games on his XBOX and he looked at me and said, "But why do I get a full hour?" I reminded him that it was Saturday and that that was the privilege he earned. He threw his arms around my neck in happiness and excitement-he had already FORGOTTEN that he gets this special time! And now? I'm a rock star in his eyes. Happy kids again.......happy mom.